Thank you for taking the time to join us on this grand occasion. To the representatives of the government, the honorable guests and Archbishop of the Philippines, let me express my appreciation for your support for this event today. This shows that every one of us has a loving spirit in wanting to protect animals, which we express in different ways. I hope that this book will awaken the love power that lies within everyone. Because each one of us has God, or the Buddha Nature, within us, surely we have love and compassion as well. However, due to our busy life and excessive pressures from the need to survive in this world, we often lack the time to recall this love within. Some people are able to express this love and remind themselves, while others are busy or have forgotten how to bring out this inner love power. We ought to remind and love each other, including loving animals. They appear weak, small and helpless, needing our worldly and material help, love and protection. However, if we truly understand animals, we will realize that they are on a high spiritual level. If we love and protect animals, in return, they will help us in many ways. However, we should not help animals because we expect benefit, but because we love the weak and small. This is the way of the true hero. Heroes do not have to go to war or perform spectacular deeds. The heroic quality lies in the heart. If we can love and protect small animals, that means we can also love and protect other sentient beings. Someone said to me: “If a person can love a dog, a bird or any other weak and small animal, that person definitely can love other humans too.” Thus, by loving animals, we help bring peace to the world. If we do it together, there will be no more wars among us. When we love and protect animals, our compassion will develop naturally. If any of you have a dog, a bird or other pets, you will have noticed this change. When you hug them or look at them, your heart will naturally fill with love and you will not think of anything else. 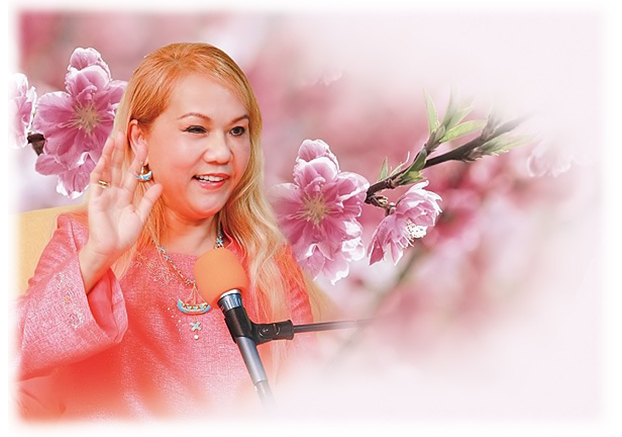 By loving and pampering them, this loving aura will pervade our house, our whole family, and emanate beyond, extending the positive atmosphere to the world. Therefore, animals can help us develop our inner love, change our ambiance, and make us happy; and this happy atmosphere will affect the whole world. Imagine if every family could be so happy and loving; of course the world would be a wonderful place, wouldn’t it? (Audience: Yes.) We don’t need to talk about whether animals are of a high spiritual level or of any significant benefit to us. At the very least, they can help us develop our compassion. That alone would make us feel very comfortable. If we have time to sit with a dog, pat it, and show our love, very soon our whole body will feel very comfortable. Even our body feels comfortable, not to mention our atmosphere. Our whole body feels the presence of a serene electrical current that is very soothing. We can feel it distinctly. Therefore, dogs can really help us in this way; it is not necessary to communicate with them through supernatural means or use telepathy to understand their language. Just the sensation in our physical body is enough to prove that dogs are truly helpful to humankind. In the Bible, it is said that God created animals to help us. We should give some thought as to how they help us. My personal experience is that they have helped me. Scientists have proved that if you love animals and keep pets at home, you will be physically healthier and mentally happier. When you are happy, you attract good luck and a happy atmosphere to your home because like attracts like. Also, seeing your pets every day, your love will develop, and this love will attract more love. For instance, when you go outside, people will love you more, dogs won’t bite you, and you might attract more love to your home. Therefore, in helping animals, we truly benefit ourselves as well. No matter whom we help, we always benefit. We often think that when we help others, it is the other party that benefits. This is not necessarily the case! That person will reciprocate with love. So, when we help someone, he will be grateful and pray for us, and our lives will be more comfortable and happy. Prayers are effective! Animals communicate directly with Heaven. So, if we help them, they will surely report to Heaven that this person is very nice. We can say that they pray for us. If not, Heaven has eyes! If we have been nice to people and helped them, Heaven will record it. When we help animals, Heaven will also record it. Whether this story is true or not, we should love and protect the small and weak when we see them, for in doing so, we show the magnanimous heart of a hero. As such, we are already a noble person and would not wonder whether they will help us or not. Of course they have helped to bring out our noble heart, which is more important than wealth or social status. Thus, we ought to love animals. 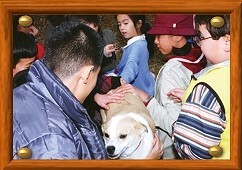 In every country, there are animal shelters or similar facilities. We should do our best to help them in any way we can. If we cannot adopt any animals, we can make a financial contribution or help these organizations take care of animals or find good families to adopt them.